The F8 Tributo is the new mid-rear-engined sports car that represents the highest expression of the Prancing Horse's classic two-seater berlinetta. It is a car with unique characteristics and, as its name implies, is an homage to the most powerful V8 in Ferrari history. The turbo-charged V8 has already been used in other models in the range with various power output levels, winning "Best Engine" in the International Engine of the Year athree years running in 2016, 2017 and 2018. In 2018, it was also awarded the title of the best engine of the last two decades. The F8 Tributo delivers its 720 cv without the slightest hint of turbo lag and produces an evocative soundtrack. Instantaneous power is matched by exceptional handling thanks to the integration of state-of-the-art aerodynamics solutions derived from Ferrari's track experience. 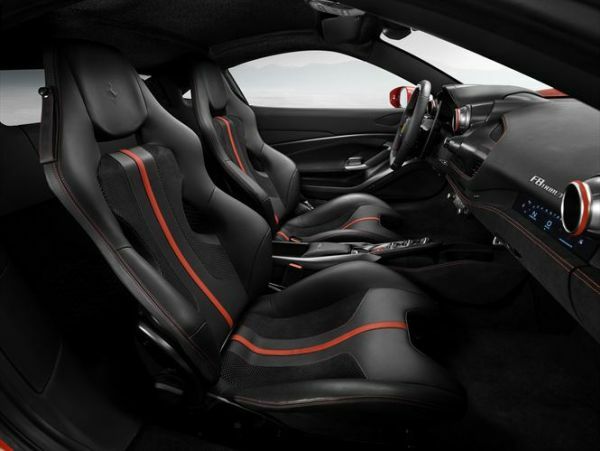 Designed by the Ferrari Styling Centre, the F8 Tributo is essentially a bridge to a new design language that will continue to emphasise Ferrari's key characteristics of high performance and extreme aerodynamic efficiency. 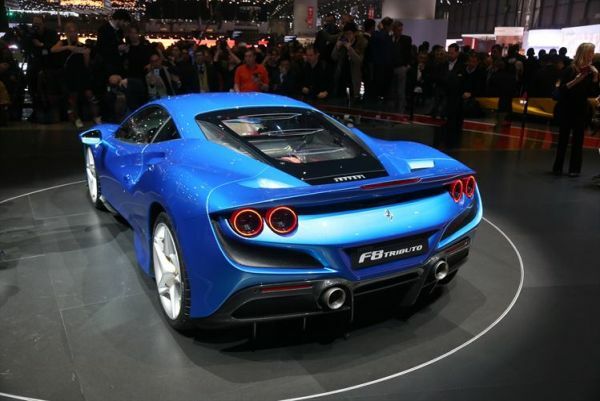 In fact, the F8 Tributo is the most aerodynamically efficient series-production mid-rear-engined berlinetta ever designed. 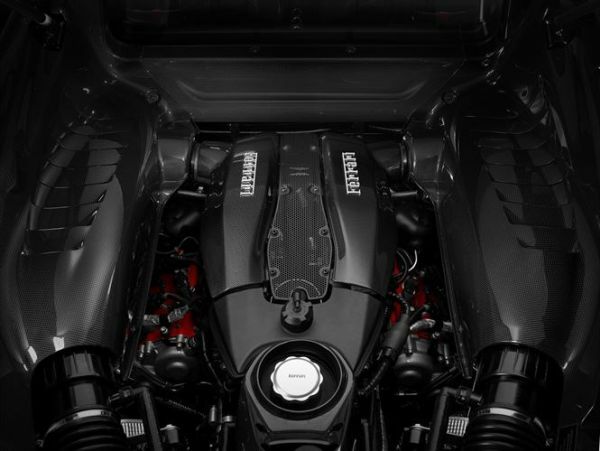 In the automotive world, Ferrari's V8 engine is seen as the very epitome of sportiness and driving pleasure. This is particularly the case when it is mid-rear-mounted in a two- seater. Ferrari has been honing the scope of abilities of this architecture, which creates an optimal weight balance, and thus delivers unparalleled thrillingly sporty driving, to perfection for over four decades. The same mid-rear V8 two-seater architecture was also adopted for Ferrari's first supercars, not least the 1984 GTO and 1987 F40, which have achieved iconic status amongst enthusiasts. The V8's technical specifications are truly exceptional, placing it at the very top of its segment. The F8 Tributo unleashes 720 cv at 8,000 rpm and also has an impressive specific power output of 185 cv/l. Its maximum torque is now higher too at all engine speeds, peaking at 770 Nm (+10 Nm compared to the 488 GTB) at 3,250 rpm. The new car offers drivers pure emotions. Instantaneously accessible power is matched by exceptional handling thanks to advanced vehicle dynamics solutions. These include a new version of the Ferrari Dynamic Enhancer (FDE+) which can be activated in the manettino's RACE position for the first time, a move designed to make performance on the limit easier to reach and control for an even greater number of drivers. As their starting point the powertrain department used the488 Pista's engine, which already has 50% more specific components than the 488 GTB. 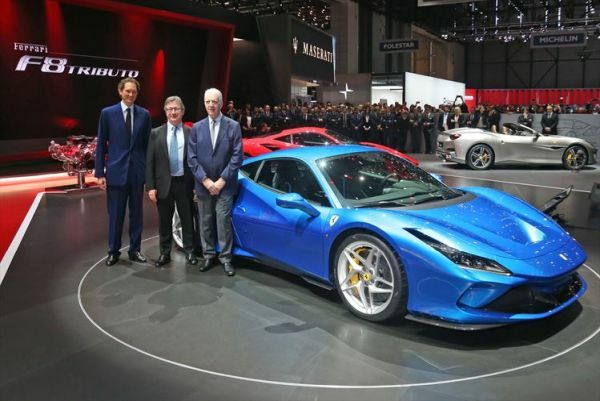 The challenge was two- fold: on the one hand they had to maintain the performance levels achieved with the 488 Pista while, on the other, deliver unique performance and sound that also complied with the new, stricter emissions and noise pollution regulations. Specific valves and springs combined with a new cam profile also contributed directly to the engine's performance increase. As did the geometry of the new exhaust manifold which reduces back pressure. 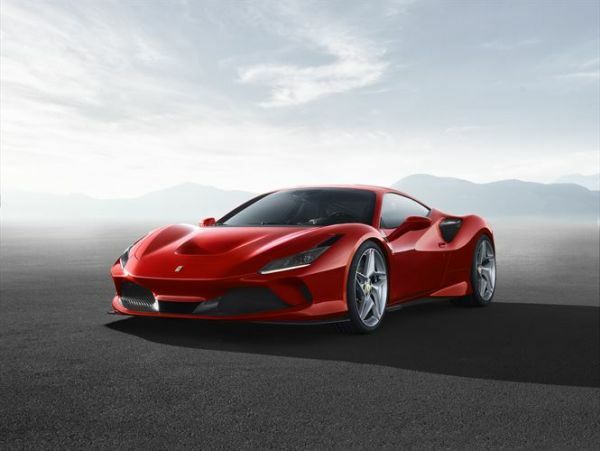 The F8 Tributo's engine also inherits highly efficient weight-reduction solutions from the 488 Pista which have cut the power unit's weight by 18 kg compared to that of the 488 GTB. Once again, the racing world played a pivotal role. In fact, all the main lightweight components are derived from either the Ferrari Challenge or Formula 1. Reducing the weight of rotatingand non-static masses, such as the titanium con rods, crankshaft and flywheel, allows engine speed to rise very rapidly, so much so that the driver can see the rev counter needle flying, particularly in rapid transitions, such as gear shifting and scorching low-gear acceleration, making the car feel even sportier still. These reductions in the weight of the rotating masses yield a 17% reduction in inertia. Apart from the extra power, the F8 Tributo's engine makes both the car's handling more intuitive and its performance more accessible. A slew of high performance features have been introduced to allow drivers exploit to the very fullest the potential afforded by the best engine of the last 20 years. These include a new boost reserve control strategy which optimises response time and performance in sporty driving on the limit, making all the power the driver asks from the throttle available virtually instantaneously. The rev limiter's "Wall Effect" strategy is another leap forward in terms of extreme engine performance. Rather than gradually limiting the revs towards the limit, it cuts off right at the red-line of 8,000 rpm, maximising the amount of power available in power-on dynamic driving situations and consequently improving lap times. Adopted once again on this model is the hugely successful Ferrari Variable Torque Management strategy for all gears. To adapt it to the car's extreme sporty spirit, all of the curves were redesigned to deliver a feeling of consistently smooth, powerful acceleration all the way to the red line. 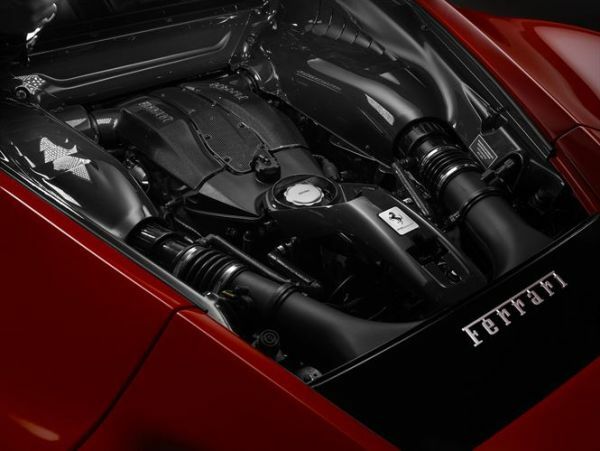 To achieve their goal of making the car's impressive performance easy to access and use, Ferrari's engineers worked on integrating engine and aerodynamics performance with the latest iteration of the vehicle dynamics control systems. The Side Slip Control system, which improves drivers' control on the limit for even more engaging involvement, has been further evolved. The transition from version 6.0 to 6.1 reflects the fact that the Ferrari Dynamic Enhancer system now also activates in the manettino RACE (FDE+) position. The 40 kg weight reduction compared to the 488 GTB makes the car sportier and more agile and makes a significant contribution to driver involvement. That said, the weight reduction does not impinge on in-car comfort in the least as it regards engine and bodywork components. Aside from the aforementioned engine components, further lightweight solutions include bumpers made from a lighter plastic material, a carbon- fibre rear spoiler and a rear window in Lexan® which is lighter than glass. The weight reduction measures are topped off by the choice of optional carbon-fibre rims and a lithium ion battery. The F8 Tributo cuts the lap time at Fiorano from 1'23.0" to 1'22.5". aerodynamics, integrating innovations and expertise developed thanks to the company's involvement in the GT and Challenge championships. The solutions have been honed to create a series-production mid-rear- engined berlinetta with the highest level of performance available. It was only through close synergy with the Ferrari Styling Centre that the strict aerodynamic constraints could be so flawlessly interpreted and integrated into the car's design. A good example is the S-Duct at the front and the redesigned blown spoiler system at the rear which are underscored by the car's clean yet decisive lines. The F8 Tributo is powered by the multi-award-winning Ferrari V8 turbo which punches out 50 cv more than the 488 GTB. To cope with the increased cooling requirements and to guarantee maximum performance under any driving conditions, the car's thermal management was assessed from earliest stages of development in order to optimise cooling without impacting on aerodynamic performance. In absolute terms, there is a 10% improvement in thermal performance over the 488 GTB. Thanks to this layout choice, the increase in radiating surfaces was kept to a mere 7% which benefits both the car's weight and dimensions. 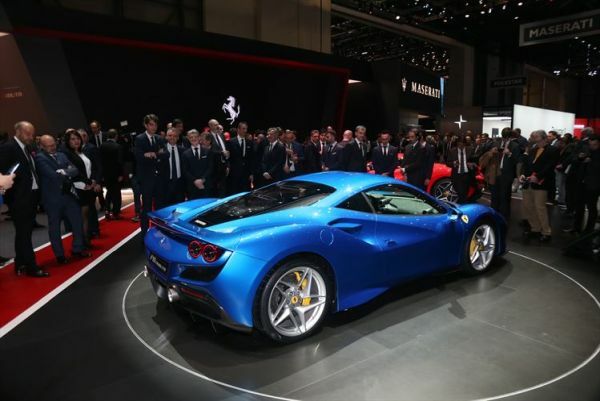 A further improvement was made possible by the modifications to the rear of the car moving the dynamic engine air intakes from the sides (as on the 488 GTB) to either side of the spoiler. Moving the air intakes from the sides to the rear also freed up space for a larger intercooler. The engine air intake duct benefited from this decision: the significant reduction in its length and the high overall pressure levelguaranteed by the rear spoiler drastically reduces fluid-dynamic load losses, thereby contributing to the increase in engine performance. The front of the car is dominated by the S-Duct, an innovation aerodynamic solution adapted from Ferrari's F1 experience and already used on the 488 Pista. 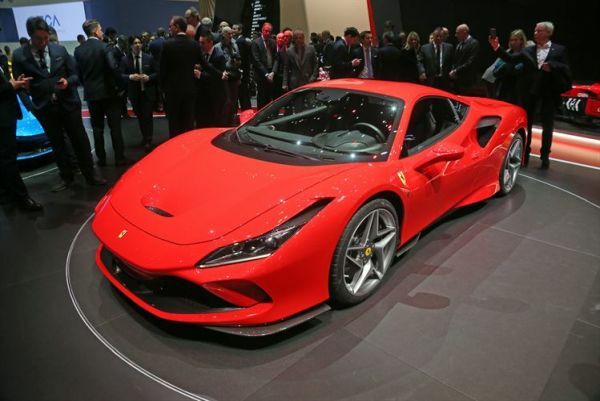 Here it has been redesigned in function of the new front end design and accounts for 15% of the increase in overall downforce compared to the 488 GTB. The duct takes the high pressure flow from the central section of the bumper and, thanks to specially calibrated sections, deflects it upwards through the vent on the bonnet. The variation in pressure generates downforce over the front axle. The position of the vent is designed to maximise the duct's performance by exploiting the suction generated by the curvature of the surfaces, maximising the amount of air that passes through the S-Duct. New, more compact, horizontal LED headlights allowed Ferrari's aerodynamicists to incorporate new brake cooling intakes in combination with those on the outside of the bumper, the aim being to improve air flow throughout the entire wheelarch and thereby avoid having to increase the size of the braking system to cope with the higher speeds reached by the car. The blown spoiler's calibrated sections work in synergy with the suction generated by the spoiler to create upwash which accounts for 25% of the increase in downforce compared to the 488 GTB. Contemporaneously, three turning vanes inside the blown spoiler effectively recompress the flow towards the wake of the car, reducing drag by 2% and compensating for the knock-on effect of the increase in downforce. The rear diffuser has a double kink line, which generates a double suction peak near ground level and accounts for 20% of the improvement in extraction and downforce generation capacity compared to the previous model. The diffuser is equipped with a system of three active flaps which rotate 14° in minimum drag configuration to completely stall the diffuser and thus significantly reduce the car's drag on straights, allowing it to reach top speed. To sum up, the increase in the F8 Tributo's overall aerodynamic coefficient compared to the 488 GTB is due to modifications made to the S-Duct (15%), rear spoiler (25%), front underbody (15%), vortex generators (25%) and rear diffuser (the remaining 20%). Designed by the Ferrari Styling Centre, the F8 Tributo is essentially a bridge to a new exterior design language. From the very earliest stages of the design process, the work focused on two goals simultaneously: designing a stylistic tribute to the Ferrari V8 engine, inspired by the most iconic mid-rear-engined V8 sports cars in Ferrari history, and giving the car a strong personality of its own through an even sportier design clearly inspired by the car's advanced aerodynamics. A lot of attention was paid toensuring that the Maranello marque's signature styling elements were respected even while seamlessly incorporating the aerodynamic elements into the design and then underscoring them with clean yet decisive lines. The car's flanks are dominated by the evident muscular forms of the front and rear wheelarches which give the impression that the bodywork has been tightly moulded around the running gear with no space left over for non-functional stylistic motifs or voids. The shape of the side air intakes for the intercooler has been redesigned too, highlighting one of the most important stylistic motifs from Ferrari mid-rear-engined V8 history. 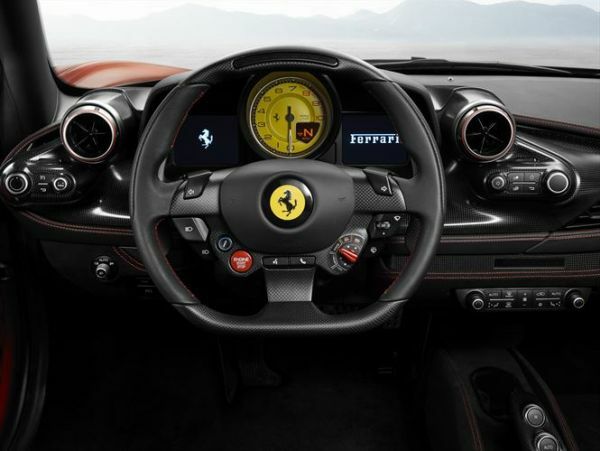 The new rear screen celebrates Ferrari's legendary V8 engine. Made from ultralight Lexan®, it has been restyled to incorporate three louvres at it centre and showcase the engine compartment, bringing a modern twist to the most distinctive design element from Ferrari's most famous V8-engined car, the F40. The louvres also help extract hot air from the engine compartment, in line with Ferrari's focus on functional design. The rear of the car has also been strongly influenced by the car's new styling. Aside from the rear screen, the spoiler has been entirely redesigned. It is now larger and wraps around the tail lights, visually lowering the car's centre of gravity and allowing a return to the classic twin light cluster and body-coloured tail, another signature of the early 8- cylinder berlinettas like the very first in the legendary series, the 308 GTB. New round air vents are set in beautifully sculpted aluminium surrounds (also available in optional carbon-fibre) which cleverly underscore the dash structure. To emphasis the lightness of the whole assembly, the dash now incorporates an aluminium sail panel supporting the central satellite and continuing into the dash itself. Also to create a sense of visual lightness, a sliver of carbon fibre divides the upper and lower parts, streamlining the whole look. This section also incorporates the optional 7" touchscreen passenger-side display which provides an extra sporting touch. The dash is completed by the classic instrument cluster with its central rev-counter and the new- generation steering wheel and commands.